The moment I saw Seth Apter’s science fiction looking rubberstamps I had to have them. They suggested the Out of this World is the theme. Starry skies and science make me feel delighted, scared, and hopeful all at the same time. However, the project evolved and surprised me. I’d picked out StencilGirl stencils I wanted to use with the stamps months ago and then three new ones leapt into the fray! I was a massage therapist for 2 decades and it seemed to me, in my little microcosm, that women over 50 lived easier in the world, body and soul. Hence, Sue Pelletier‘s Loose Woman series of stencils for StencilGirl Products speaks to me. (Apologies to Sue if she saw her creations as younger!) I used the small ones and you can see them in a video HERE. This little canvas celebrates ME though a riff on one of my favorite books of all time, “THE LITTLE PRINCE” by Antoine de Saint-Exupéry. It is always a good read when I need perspective in my life. 70 is the really hard birthday! 50 means you are just beginning your creative journey! 50 is the new middle age. I’m younger than you are! Do you feel old mom? and fortune and friends smile upon me, too many well wishes to count! I think, if birthdays ending in 1 through 9 make us reflect on the year behind and the year ahead, those ending in 0 make us look at who we are against the journey of all we wanted to accomplish. I’d like to say “within the journey” but I seem to push back more often than not. Represented on my canvas by the (hopefully) extinct volcano. Rabbit was my nickname as a child. The Rabbit is sitting in for The Fox. My Flower under glass represents all the characters and stories swimming in my grey matter. A daring 50 years young woman might accept the responsibility and remove the glass… Seriously, my personal goal for the year is to write my way out of my novel “BRAMBLES”. It was enormously difficult to choose a planet from among Seth Apter’s Solar System and Roundabouts rubber stamps for Impression Obsession; each one is so interesting. I did not even have to put the stamps on a block to stamp. The lines and details stamp impressively clean on the no-fray (slightly bumpy) fabric in the photo below. The more I look at them to more ideas I get. 1) Paint canvas background and add a critter silhouette at bottom looking up. 2) Stamp the largest of Seth’s planets on fabric (I used non-fray fabric) with Staz-On ink and cut out the planet. 3) Figure out where the place planet, volcano, flower, lone star (below planet) and loose woman. 4) Stuff planet with cotton and hand stitch to canvas with thread that matches the ink. 5) Stencil Loose Woman #2 because I liked her long hair and she is a lady leaping. 6) Stencil flower using Eastern Leaf Lotus Flower Repeat #L421 stencil and use iridescent paint to cover like a bell jar. 7) Paint volcano and small green Baobab tree seedling. 8) Paint her hair (or you could embroider) with rainbow strands. A good friend of mine, Christine, hates the waste of envelopes. My boss, Mary Beth Shaw, has taught me to use them for art journaling. Recycling some envelop insides for clothes and making cards seemed like a good compromise. 2) Play paper dolls with me! Stencil each Loose Woman on a card. 4) Glue clothes on woman, detail boots and each breastplate, then glue woman on the background. 5) Stencil and stamp envelopes. 6) Address to another loose woman. 7) Go forth and impress your local postal clerk. Optional: There are Star Trek stamps and planet stamps available right now! Live long and prosper! May art allow you to unwind! StencilGirl Products will be giving away a $25 Gift Certificate to TWO lucky winners! Impression Obsession will be giving away a $25 Gift Certificate to TWO lucky winners! your chance to win 4 great prizes during the hop! Carol Baxter – You are here! StencilGirl’s Facebook page on Sunday, October 2nd. As I write this post, there is a cacophony of voices in my head as my former newspaper editors Jerry, Richard, Jim, Pete, Tom and Autumn telling me that my words must be pared-down. Jen Cushman is there too, reminding me one word for the Talisman Project, Carol. Characters with their foibles, courage, hates, loves, desires, and interactions make the STORY. (I am quite partial to science fiction and fantasy… Greg Bear, Guy Gavriel Kay, Jacqueline Karey, Patricia McKillip, Gregory Benford, and Harlan Ellison to name a few. STORY is my Talisman for 2014 because if I stopped writing “Brambles” right now to make a piece of jewelry that said NOVELIST, it would take time from my preciously carved-out writing time–besides, I when one writes until the story is finished, one gets stories of many different lengths and I am working on more than just one. A couple of years ago I made this bracelet as a gift for an author friend, Eve Paludan, and I liked it so much, I made one for me but it has sat neglected in my jewelry box. 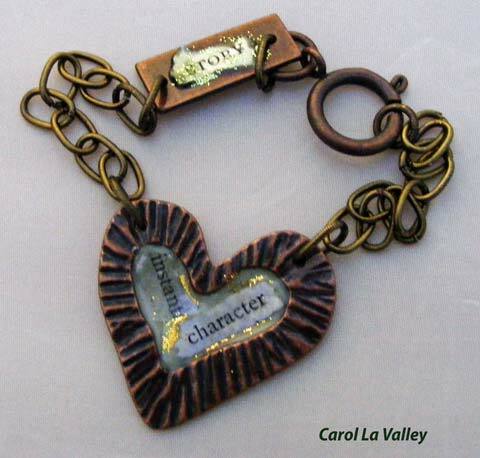 I made it with an open back bezel and chain from Susan Lenart Kazmer’s Industrial Chic Line. Torn words from a dictionary, ICE Resin, German Glass Glitter, Staz-On Ink, a bit of paint (it looks like I used a green aqua color to tint the resin), chain, clear packing tape, a craft cup and a stir stick, jewelry pliers, and a disposable paint brush. 1. Tear your words out and edge if you wish with ink so they stand out. 2. Mix ICE Resin per manufacturer instructions. Add a drop of acrylic paint for color if desired. 3. Apply packing tape to back of bezel. Burnish edges with your fingers so the resin does not leak. 4. Drip a little resin into the bezel. Add words and glitter. Drip more resin. Tip: be careful not to over fill when working with a smaller bezel. 5. To place word STORY on flat piece of metal, I painted on a little ICE Resin first, put the paper down, another swipe of resin then a wee bit of glitter. 6. It dries and is ready to wear in about 6 hours. Stay tuned on the ICE Resin blog for more Talismans and interesting, touching stories of why a particular designer chose his or her Talisman word. We hope it moves you to achieve your dreams! If you want to know more about Talismans, Susan talks about them as numbers in these posts: 4 plus 3 and Lending Power to the Ordinary. It is Day 7 of the blog tour for Spinster’s Folly by Western novelist Marsha Ward. I expect a book to lead me into another world (usually science fiction) and immerse me in its characters. This year, I made an agreement with myself, that just because I downloaded a book to my Kindle, brought a book home from the library friends’ book sale, or walked out of a retailer with one, I would allow myself the pleasure of not knowing the end if the book was not worthy of my time. Without an easy way to get to the eBook-of-the-night’s cover, the character(s) must vigorously, joyously, walk off the page. Marie Owen, in author Marsha Ward’s Spinster’s Folly, does just that. Marie feels she is on the verge of becoming a spinster and there are few prospects for a decent suitor let alone a match in Colorado Territory, but sometimes, you can’t see what is plainly in front of you. Julia drew her shift over her head again, smoothing it down over her body as she glanced sidelong at Rod. He lay beside her, his eyelids only half open as his breathing slowed. “You’re a caution, you know that?” she murmured, wanting to snuggle against his bare chest, but resisting the impulse. The night wasn’t as long as it needed to be, and they had best get to sleep. He took a long lungful of air before replying. “I missed you. I missed my Julie-girl.” He slid his arm under her neck and, turning to her, exhaled softly into her ear. She wanted to tell him that was nonsense, but knew he would take it as a challenge and that would be that for a good night’s sleep. Instead, she gave him his nightshirt and asked, “Did you encounter any difficulties in makin’ your arrangements with Ed Morgan?” She waited until he’d put the nightshirt onto his head before she let her fingers explore the red spot at the base of her throat where his enthusiasm had gotten out of hand. Gems in life are where you find them. The bulk of what I read is science fiction. I was easily in my 30s the last time I read a Western, although in my 20s, I read a lot of Louis L’Amour. I found his plots quick and his characters believable. L’Amour was a master of allowing the reader to escape into the magic of another time and place. Marsha Ward is a master of allowing the reader to escape into the magic of another time and place. 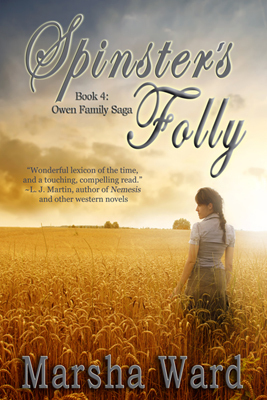 Spinster’s Folly is the 4th in the Owens Family Saga but stands up tall on its own two feet. 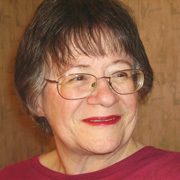 Marsha Ward is an award-winning poet, writer and editor whose published work includes four novels in The Owen Family Saga: The Man from Shenandoah, Ride to Raton, Trail of Storms, and Spinster’s Folly; and over 900 articles, columns, poems and short stories. She also is a workshop presenter and writing teacher. She has her own blog as well as one for the characters living in her head. You connect with Marsha on Twitter and Facebook. What lesson in life did you learn the hard way? Describe a time when your life took an unpredictable turn. Who do you think of when you imagine someone saying, “I believe in you.” Now, write about a time in your life when just knowing someone believed in you made a difference. Tell about a friend from each major stage of your life, and let us know why you think of that person as your friend. What slice of your life would you like your children to know that shed light on what has meant the most to you? What do you wish you could have asked your parents? What message would you like to send to your Mother? Your Father? As you look back over your life what threads do you recognize? So far, what are your sacred moments that come to mind? Write about several moments in your life that touched your deepest feelings. What one thing did you save that belonged to your parents? As you look at it, what do you think? What are your feelings when you touch it? Write about a time when you went through a spiritual crisis. Write about some places of beauty that touched your heart and that you cherish even to this day. What is the most surprising gift you ever received? Explain the circumstances around receiving this gift. What is the most enjoyable gift you gave to someone else? Explain. Write of several qualities of your grandparents that you would most like your grandchildren to possess. Write about the greatest peer pressure you felt as a teen since your grandkids feel it every day. Write about the hardest phone call you ever made. Write about the hardest letter you ever wrote. How about the hardest received? Write about the worst rejection you experienced as a teenager. How did you handle the situation? Write about how your family handled the bad times during your early years: divorce, death, arguments, lawsuits, and/or estrangements. Were there any cautionary tales within your family when you were growing up? Write about one. Write of one specific time when you felt hopeless and alone. What helped you through the experience? As you write, think of how best your grandchildren can learn from this experience. When you were a kid who could you always go to for honest answers? Explain who, explain why. Write of a single experience out of your past that found you caring and supportive of someone who was going through difficult times. Write of an instance when time seemed to stop and you knew you were part of a moment that held great significance. Write how you would choose to die plus the timing. Explain why. Explain to your children some of the things you want to experience before you die. Write a list. Explain why. Share your feelings about being left alone should your spouse die first. What apprehensions do you have about suffering? How will you explain these feelings to your grandchildren? Write about a time when you struggled with your identity and self-worth. This may be helpful to a grandchild. Write about the mirror of comparison that might have distorted a part of your early life; the comparison of telling you how much you lacked. What is your faith and how do you experience it? List five things you like about yourself and write a 50 word paragraph on each. Write about something you learned from forgiveness. Write about something you learned from fear. Write about something you learned from contentment. Write about something you learned from discipline. Write about something you learned from joy. Write about an experience in your life when you and your family experienced a flood. Describe it. Write about an early drought that impacted you and your family. Describe a dust storm you experienced as a kid. What was it like? Describe the coldest and harshest winter you can remember. What kind of heat did your house have when you were growing up? How did you keep warm? What was the process of staying warm in dead winter as a kid? What was the biggest snowstorm or blizzard you remember as a kid? What things did you have to do to survive such a storm? Were people more secure in their family values when you were growing up than they are now? Why? Why not? How common was working mothers in your day? Have working mothers been good or bad for our society? Explain why or why not. Write about a time in your childhood when father knew best. Write about a time when your father knew least. What was the balance between freedom and authority in your home when you were young? Write an experience from both. Write about a time when you and your new spouse/significant other had an experience that was fun, wild, and spontaneous. Make a list for your grandchildren of some things you currently consider romantic. Describe a getaway experience you and your spouse/significant other had that was memorable. Write about an early experience when you and your spouse/significant other were aggressive and extravagant in your romance. Write about an experience where your romance was so predictable and boring that it was humorous. Where did you live during your childhood days and who lived with you? What kinds of make-believe do you remember playing as a child? Name and describe the pets you had when you were in grade school. Write about them. What do you remember feeling the first day of school? Describe it. What do you see going on around you at meal time when you were a child? Write a memory of the kind of music you typically heard as a child. Write a memory of the kind of music you typically heard as a teenager. Write a memory of the kind of music you typically heard as an adults. What fills up your senses? What is your favorite meal and why? What do you love to look at? What thrills your taste buds? What scents entice you? Why? What scents repulse you? Why? Describe the cars you have owned in your lifetime. Write about a memorable fishing trip. Write about a memorable camping trip. Write about a memorable vacation. If you were baptized, what were the circumstances around the event? What were the circumstances around your baptism? Did you have a memorable babysitting experience when you were a teenager? Explain. Write of one significant Depression experience that has stayed in your memory all these years. Write a memory of your first few days in Navy boot camp, or Army basic training. Write about some of the ways you carry a positive influence of your parents. List them and explain each. Write of some ways you carry a negative influence. Write of an experience out of your past that found you in a very deep and powerful relationship with your parents. Write of an experience out of your past that found you in a very deep and powerful relationship with your children. Write of an experience out of your past that found you in a very deep and powerful relationship with your grandparents. Write of a childhood experience of genuine solitude you had that impacted your life? Explain the circumstances and what you learned. Write of your most romantic experience s ever. What roles did you have as (choose one): an only child; as the oldest child; as the middle child; as the youngest child. Describe the house your family lived in the first years of your life. Describe all the nicknames of your siblings and friends and the history behind them. Write about your weirdest Christmas eve. List some of your favorite things and explain why they are your favorites. What was the worst thing that ever happened to you at work? Who is the one person I really miss in my life during the holidays? Why? Write about one childhood Christmas that really stands out? Why? Write what the word “blessed” mean to me? Why? What are your current political views and have they changed over the years? Describe the view from a particular window. Describe a sport you play or played. What is your all-consuming hobby? Are you a sports nut? What makes you crazy—pet peeves? How do you handle them? Describe a favorite teacher or business mentor. What is your sense of humor like? Your favorite joke? Were you the class clown? Poisonwood is easily my favorite novel by Kingsolver. I love the way she switches POV in each chapter between the sibling and the mother and father (preacher.) The hubris of the father uprooting his family to the Congo to convert the natives is dealt with honestly by the author. I was 12 and it took me a solid month to read this book, a chapter at a time. It was easily the hardest book I had ever read at that point in my life. Michner always shared what was fact and what was storytelling and it was the introduction that first captured my attention. He said some of the names of people he wanted to thank for interviews had to be omitted so that their lives would not be endangered. Wow. People lives could be endangered by words. That made no sense in my white-bread world. Insight into the mind of one of the greatest storytellers of all time. Style + research + whole characters = excellent way to spend a weekend reading. Shifting shadow until I get to Amber. Rich, luxurious language. Ahhhh. Romance. Interwoven plot lines. Perfection. Memorable characters on a future dystopian Earth struggling to survive. It is about the human need to trust even when past experience tells you the helping hand might slap you instead. SF combat, aliens and government conspiracy. Fun! Desire to Inspire, Using Creative Passion to Transform the World by Christine Mason Miller. I have not blogged for myself in ages, but it has been on my To Do List. The other day it moved closer to the top of the list, but I must have a theme that is not binding so I chose Lists. I am a list maker. I can be compulsive about it but I have to tell you that I find satisfaction in marking though a task accomplished. Can you judge a person by their magazines? I do buy magazines that catch my eye in single copies however, I only subscribe to one in print, because one is all I can keep up with cover to cover. On my list of writing goals is to find a brilliant article idea and get an affirmative answer to my pitch to… drumroll… WIRED. I subscribed in 2002 when Spielberg was on the cover. WIRED is where I first learned that a blind man’s brain could be wired to a portable computer so he could see the world, at least as a negative. 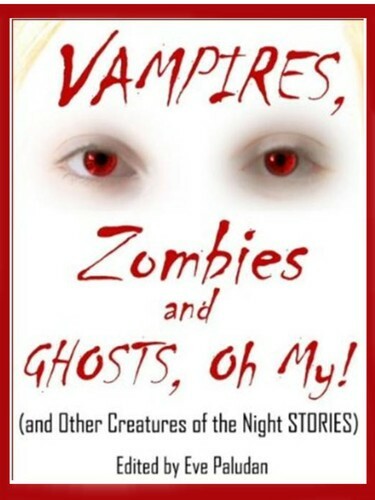 I was so captivated by this true story that I wrote a fantasy of my own, “The Bone Flute Maker”, published in Vampires, Zombies and Ghosts, Oh My! I grew up on a steady diet of science fiction and I long for Richard Branson to make one of those dreams available as science fact. WIRED is where I laugh at Predict What’s Next and where I used to laugh at Japanese School Girl Watch. Science news, gadget news, movie news, intelligent articles on people with vision, sometimes skewed, but vision none the less. The DIY issue is a recent favorite. I know life is busy when I have to make the time to savor my geekiness and read two issues back to back. Ohhh. Instead of writing this blog post, I could be reading WIRED. You’ll surely recognize this folk character…. For you’ve no flippers on your feet. Did you recognized this poem as a song and thought, the writer has the lyrics all wrong? Well, it may please you to know that you are right… as well as wrong. This “nusty, crazy, freaky” version is from a filk song, a sort of rewritten folk song, I think I heard at a science fiction convention in 1987. I even called my ex to see if he remembered the lyrics, but he did not. The actual folk song, Clementine, has no clear author or copyright status. Percy Montrose and Barker Bradford have each received credit as writing Clementine in the 1840s. The 1863 song, “Down By the River Liv’d a Maiden” by H. S. Thompson could also have provided source material. Author Gerald Brenan attributes the song’s origins to an old Spanish ballad sung by Mexican gold rush miners. Yet an older version I ran across, hints that the lovely maiden Clementine was a soiled dove. Although Clementine’s popularity has dwindled over the years she has not been forgotten. Clementine the school marm was the love interest of one of the Earp bothers in the 1946 film, My Darling Clementine. Cartoon character Huckleberry Hound was known to sing Clementine horribly off-key. Tom Lehr, a 50s Harvard math professor with a bar act, also sang of Clementine, off-key. Clearly, Clementine is not Natalie Cole, but she is an unforgettable part of the West.